Samsung have teamed up with Audi in the UK to offer virtual test drives of the new Audi TT S using the Samsung Gear VR headset, and whilst this may not be as much fun as an actual test driver, users of the device will get to go on a virtual lap of the Neuberg Audi race track in Germany. 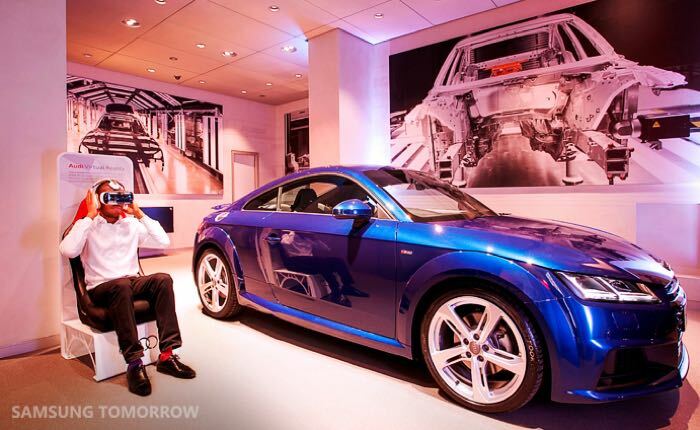 Audi will be offering this virtual test drive of their Audi TT S at 115 Audi centers in the UK, before the launch of the new TTS Coupe and Roadster in Spring of 2015. Nick Ratcliffe, Head of Marketing for Audi UK says: “This ground-breaking initiative adds a touch of theatre to automotive retail, allowing Audi customers to experience the thrill of the new third-generation TTS in its full glory. “Audi broke new ground when it first introduced the TT back in 1998, so it is fitting that the new model is launched using cutting-edge virtual technology that showcases the car’s beauty and power. You can find out more details about this new project with Audi and Samsung over at Samsung at the link below, you will also be able to go for a virtual test drive at all of the UK Audi centers before the car is actually released next year.